28 families have a need for a nearby source of clean water and adequate sanitation. Families will build 28 double pit VIP latrines and a centrally located well will be drilled in the community. Taquezal is a rural community in El Sauce about 21km from the municipal center. The community doesn't have electricity. There are 35 families and 28 homes in total. 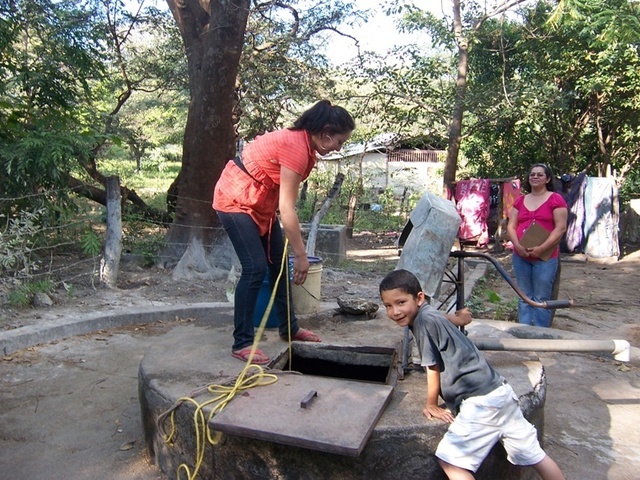 There is an existing well, built 15 years ago by a Danish NGO that no longer works in Nicaragua. Unfortunately, the water has become contaminated and the well also dries up in the dry season. The community tried to dig deeper, but they encountered a rocky layer they could not penetrate and thus have requested help with a machine drilled well. If successful, this should solve both the quality and quantity problem of the water. There are 12 existing latrines, but in very poor conditions, several are no longer in use. The rest of the homes are practising open defecation. The community has commented that there is a lot of diarrheal disease amongst the families. The people of Taquezal are mainly subsistence farmers growing beans, millet and corn. There are only 3 people in the village that practise other activities: 1 teacher, 1 mason and 1 carpenter. Taquezal has been requesting for some years with the municipality for assistance but unfortunately has not yet been attended. 35 families, 88 adults, 46 women, 47 adolescents, 22 adolescent women, 10 children under 5, 5 girls under 5. Typically in a well, a family makes 8-12 trips for a bucket of water per day. (depending on the distance to the well usually, and family members) In a day, we expect the well to produce about 20 litres x 12 trips x 35 families = 8,400 litres per day. The well capacity is hard to predict. An average capacity of a few nearby wells is about 50 gallons or 200 litres per minute. This implies a capacity of 288,000 litres per day. This will need to be confirmed at the time of drilling. Construction on the well is complete. There were some delays on the materials that the community contributed, but these have now been resolved. Fundraising is ongoing for the latrine component. All families will received hygiene and maintenance training. The latter is mostly in construction skills, but also some financial skills as they learn to manage their own maintenance fund. (c) focus on appropriate technology made from low-cost locally available materials that can be maintained by the community. The community learns how to build and maintain sanitation infrastructure themselves. -The community builds latrines (hand dig two pits per latrine to depth of 6 feet or 2 meters, line with rocks, bricks or stones, install precast concrete slab and box seat, create walls and roof from zinc panels, install ventilation tube). The superstructure shells are made of zinc and metal, so as to be easily reused (and moved) when the first pit fills. In a similar way, both pits can be reused as one fills. El Porvenir mainly works with hand dug wells which are dug by the community. 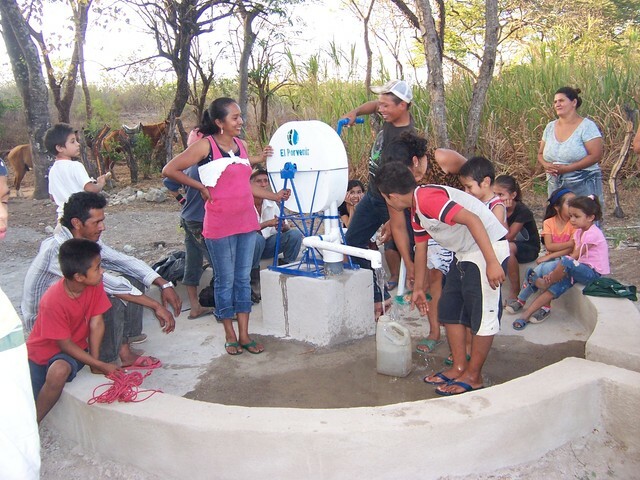 El Porvenir offers their technical expertise throughout the process and trains the community members how to repair and maintain the well. In some instances, like that of Taquezal, the water is too deep to reach by digging so the best option is to drill. There is always a risk of drilling failure as it is a more complicated process than digging. Once the well is drilled, it is sealed and capped to prevent contaminants from entering the well. EP staff will train the community members just like with the hand dug wells on how to maintain and repair the well when needed. The project can be done in two phases, latrines and then the well if the funding so requires; however we prefer to do all at once if possible. The beneficiaries of the latrines and the well have met with the El Porvenir Promoter and agreed to carry out the work needed to implement these projects. They have agreed to use, take care of and maintain them. This includes keeping the latrines and well in good condition, preventing contamination of the surrounding area and implementing a cleaning rotation. The community will be trained in community organizing techniques and will have a functioning potable water and sanitation committee (CAPS). Latrines are built on the property of each family, so each family owns their own latrine through their labor of building it. Community ownership is felt by the community through its identification of its problem, their monetary contribution (at least 5%) and their involvement in the sweat equity of the project. The well location is legally placed in the name of the CAPS so future disputes can be avoided over who has the right to access it. El Porvenir has signed MOUs with our municipal governments. In the case of El Sauce, the government supports the project materials cost at 10%. The government is very willing to help with these types of projects as it is their mandate to provide water and sanitation services to their communities. Finances has proved to be a barrier to fulfilling that mandate. The community learns how to reduce water and sanitation related illnesses through good hygiene practices. See attached spreadsheet. Co-funding for this project is coming from the municipality. The community contribution is in-kind for digging the double pit latrines, lining the pits, installing the exterior structure, and installing the rope pump for the well. Also the community is contributing local materials like sand, rocks and cement and in total at least 5% of the costs of the materials, be it in kind or purchased.